The DIA memorial was designed and built in remembrance of the seven members of the Defense Intelligence Agency that were victim to the attack on the Pentagon on September 11, 2001. When approached to design a public art memorial for the DIA’s fallen colleagues of 9/11, Classic Glass designer – Jacob Robison felt that it was important to represent the vision and mission of the DIA community. The men and women here are committed to serving our country and its citizens. They are dedicated to defending our nation and providing its leaders with information that ensures our security. With these goals in mind, a structure that symbolized our nation’s unity and strength was envisioned – a strength that the individuals we honor represented in their devotion to their country. For more than 200 years, the American flag has symbolized our nation’s unity and resolve. It was therefore a natural choice to represent the strength of the DIA community. The shape and functionality of this memorial is representational of a flag unfurled, blowing in the wind. Seven stainless steel frames are capable of rotating a full 360 degrees. 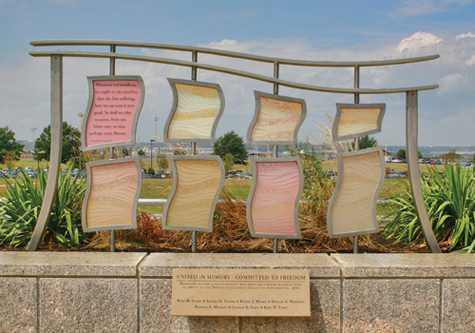 These seven unique units represent the lives of the seven individuals we pay tribute to with this memorial. Their motion is similar to a flag blowing in the wind and is further symbolic of how our lives are forever changing and evolving. 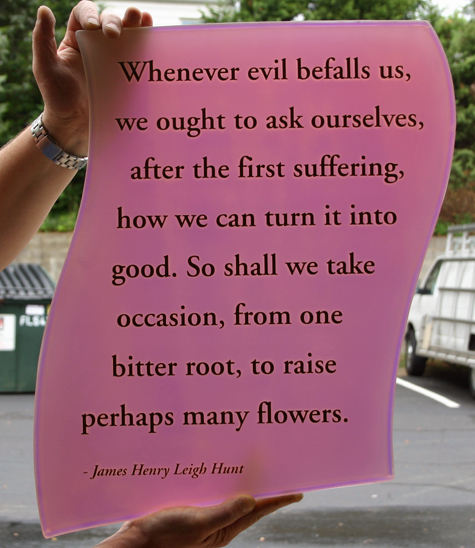 An eighth frame remains stationary, displaying an excerpt from the moving essay titled “During a Time of Trouble” by James Henry Leigh Hunt. Inside the stainless steel frames are laminated dichroic glass panels. Because of its properties, dichroic glass is able to transmit or reflect light, thus producing a variation of color and opacity. This is further symbolic of change and reflection. To emphasize a sense of motion we carved areas of the glass to replicate a flag unfurled. The rotating glass panels are also adorned with seven textured stripes – like the stripes on the American flag. The laminated glass panels are most radiant late in the day as the sun sets allowing the transmitted light to pass through the panels. This is another subtle reminder of the seven lives lost. As you look at the structure, the Pentagon can be seen behind it across the Potomac River. 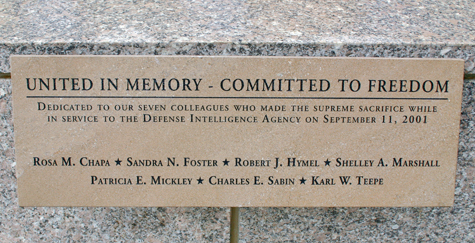 At the base of the structure lies a polished piece of limestone taken from the Pentagon debris, and the names of the seven victims are carved into the stone. The use of the building material serves as a stark but beautiful tribute to the loss of colleagues, friends and family. The Defense Intelligence Agency will hold a dedication ceremony at Bolling Air Force Base on Friday September 11th 2009. This entry was posted on Wednesday, September 9th, 2009 at 11:50 am	and is filed under Decorative Glass. You can follow any responses to this entry through the RSS 2.0 feed.Both comments and pings are currently closed.